Heat pumps bring savings on current and future fuel costs because they are much more efficient than the traditional alternatives. The latest technology for traditional oil, gas or liquid petroleum gas (LPG) boilers can only return a maximum of 90% efficiency. A heat pump on the other hand can return efficiencies up to 400%. This means that for every 1kW of electricity you put into running a heat pump you could get up to 4kW of space heating returned for a gshp, and 3kW for an ashp. 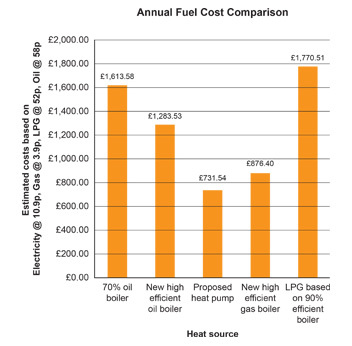 The graph alongside compares the costs of heating a typical domestic property based on an annual heating requirement of 20,000 kWhr. For this example, we have assumed the price of fuel Oil is 58p/ litre, LPG is 52p/ litre, Gas is 3.9p/ therm and electricity is 10.9p/ kWhr. As energy prices increase in the future, these savings will increase even more. In addition to the fuel cost savings, heat pumps have a high reliability and have a much longer operating life than traditional boilers. For full details of the Renewable Heat Incentive Tariff and Green Deal, please visit the official website on https://www.gov.uk/government/policies/increasing-the-use-of-low-carbon-technologies/supporting-pages/renewable-heat-incentive-rhi and follow the relevant links. The Renewable Heat Incentive (RHI) Tariff is a Government initiative whereby they will pay you a tariff payment each year for a set period depending on the technology chosen and energy savings made. The RHI for commercial applications has been running for a while and implemented for domestic properties from 9th April 2014 with tariffs released by the government on 12th July 2013. For an explanation of the RHI, please click on the video link at the bottom of page below. The RHI will be paid to the owner of the heating system at a set rate per unit of renewable heat produced (kWh) for seven years. For air source heat pumps (ASHP) the rate is 7.3p / kWh and for ground source heat pumps (GSHP) is 18.8 p / kWh. Alternativly, a ground source heat pump installed in the same property would receive £2,985.00 per annum for seven years (ie a total of £20,895 over the full period). The different RHI payments are designed to reflect the increased costs associated with installing a ground source heat pump. The Green Deal is a government scheme designed to enable you to make energy saving improvements to your home without having to pay all he costs upfront. It is an innovative financing mechanism whereby the costs of installing energy efficiency improvements, including Heat Pumps, are met by means of an extra charge on the householder’s normal energy bills. The concept is that the extra charge on fuel bills will be offset by the reduction in fuel costs as a result of greater fuel efficiency. Additionally, if the house is sold, responsibility for future payments passes to the new owner. For full details of the Green Deal follow this link www.decc.gov.uk, and click on the relevant section. The rate of VAT applicable to heat pumps and their installation is currently at the Reduced Rate of 5% rather than the Standard Rate of 20%. By using natural energy from the air or ground, heat pumps produce only a fraction of the CO2 emissions of traditional technologies, hence the reason the Government is so anxious to promote them. Additionally, in the case of oil, there can be significant environmental pollution in the case of a spillage or leak. Heat pumps eliminate the risk of gas explosions or carbon monoxide poisoning. Traditional oil and gas boilers have to operate at very high water temperatures. This carries with it the risk of burns or scalding from hot water or radiators, especially where young children are around. Heat pumps are able to operate at much lower, and hence safer, water temperatures. This lower temperature operation also improves system efficiencies.